Lavender fields provide tranquility and relaxation to the guest who wanders through the rows and leisurely picks a bundle of the fragrant stems to take home. But it's the boutique that inspires creativity and joy in incorporating the texture, fragrance, and beauty of the lavender plant for one's home use. Lavender is multi-faceted, useful for decor, toilette, and culinary purposes. It can't get much better than that! 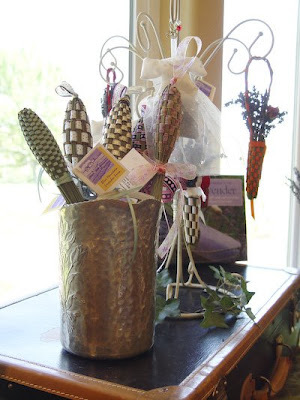 Beautiful lavender wands and baskets look pretty in the boutique. Each is different and hand-made by Karen, her mother, and daughters. Guests to the farm are invited to sit a spell and weave a wand or two as well. Pretty sachets filled with lavender bud are displayed in tiny cubicles. Each is unique. Pretty fabrics, unique patterns and shapes, buttons, aluminum name tags, and silk ribbon decorate them in unusual ways. A ribbon tassel is fragrant and pretty, as lavender bud fills the hand-made rosettes at the top where they are kept on with a pretty bead. 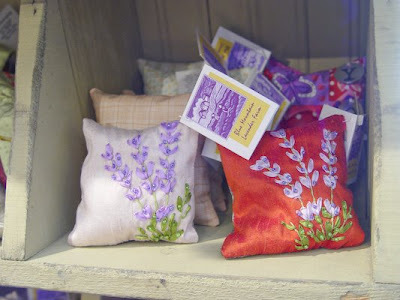 Soft and dainty flour-sack tea towels are hand-painted by Karen's dad and are beautifully displayed amongst other lavender textile crafts in the shop. Being the designated tea towel artist, he's kept busy, as these pretty tea towels fly off the shelves. Dancing Diva Dolls --- each unique and colorful --- are stuffed with lavender bud to make a fragrant addition to any room. Tiny bead necklaces and assorted styles and types of hair make each one different. 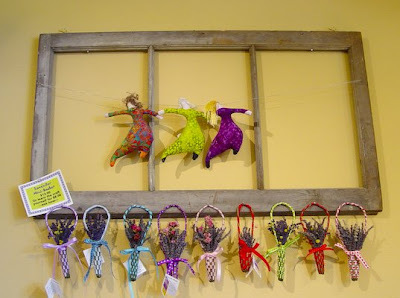 Beautiful lavender baskets underline the diva's on this window pane, giving the appearance of diva's dancing through a meadow on a fine summer day. Karen teaches classes in wreath-making. 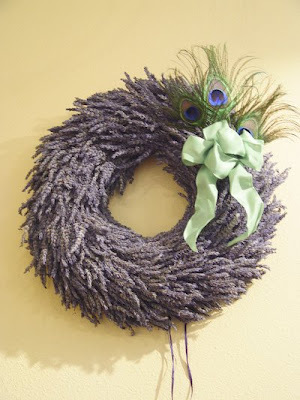 It takes much lavender to make a pretty wreath like this one! But once completed, it will grace a wall for years to come, keeping it's beautiful silvery color and adding fragrance to a room. A lavender scented shirt or blouse? Yes! 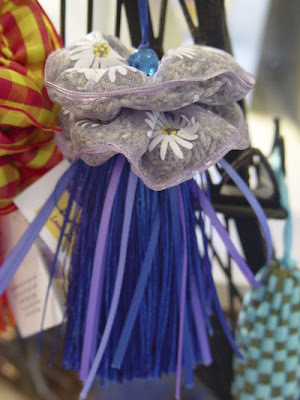 Simply hang on these pretty padded hangers, and the lavender bud used for padding will freshen up any outfit you choose to hang on it. Heavenly! 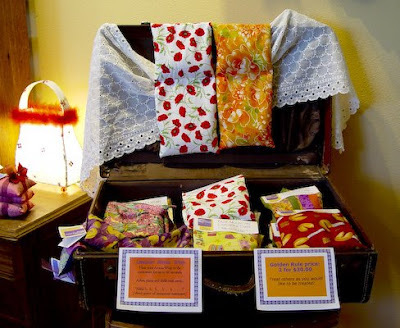 Lavender sachets for many purposes fill a suitcase display. Toss in the dryer for fragrant linens, or tuck in a lingerie drawer for a fragrance much nicer than any of the fancy fragrance papers and shelf liners can provide! Sachets mixed with rice make a soothing compress when microwaved or put in the freezer, and calm tired muscles after a hard day of work and stress. Even the dog can be blessed by lavender! I wonder if it keeps ticks and fleas at bay? 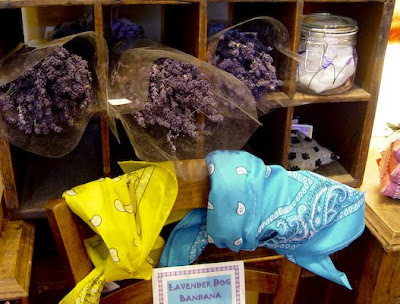 A lavender-stuffed bandanna makes Fido pretty and fragrant too! Karen has so many other beautiful products available in her shop. 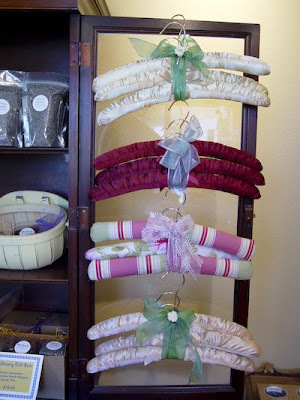 The hand-made textile products make this lavender boutique unique, as it's one-of-a-kind treasures are beautiful, elegant, and cheerful! Oh, and did I say fragrant? Additionally, Karen sells her own special blends of culinary lavender, Blue Eyes Lavender Tea, Herb d' Provence, lavender lotions, and other bath products. If you stop by, tell her 'hello' from Gracious Hospitality. I could almost smell the beautiful scent of lavender as I was perusing your post. What beautiful items! Your blog is very fragrant today! 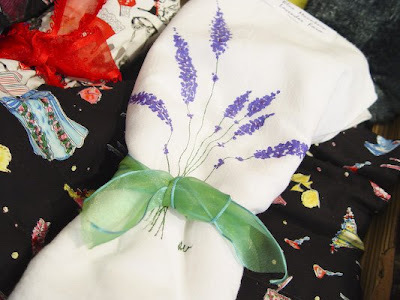 I still have some lavender bags that are reusable (supposedly) and are tossed in the dryer to tumble along with the clothes. The scent is fading, but still lovely. That lavender wreath is incredible!